Topcon QS-AC Series offers next-generation total station technologies exclusively developed to maximize survey and stakeout efficiencies. Higher work efficiency produces increased profitability. That’s how the QS benefits you. The QS provides the unsurpassed ability to automatically collimate a prism even under the toughest environmental conditions, thanks to entirely new optics, laser system, and advanced collimation algorithms. The farther enhanced super-long-range non-prism EDM gives you ultimate power in distance measurements. The QS ensures dramatic increase in both productivity and profitability. Simply tap the screen, and the QS automatically collimates the prism center. You don’t need to look into an eyepiece any more. Just roughly turn the telescope to a prism. The QS does the rest. It’s so quick. It’s so easy. It’s so accurate. The QS eliminates the time-consuming procedures such as focusing telescope and carefully adjusting two tangent screws. 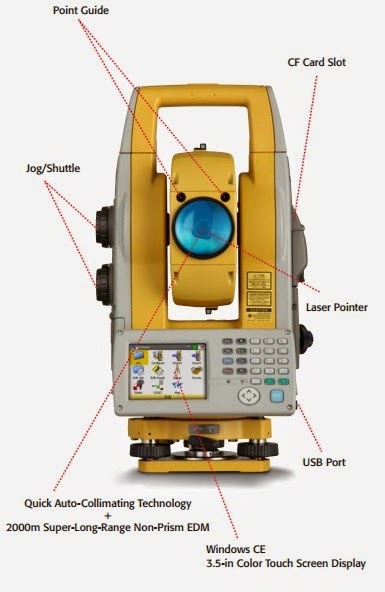 The QS allows users to complete collimation, measurement and data recording in 1/2 time compared to conventional total stations. Further more, the QS eliminates eye fatigue caused by looking into the small eyepiece of the high magnification telescope. The QS provides consistent accuracy and speed regardless of operator’s skill level. It quickly locates a prism through bushes or tree branches. It easily collimates a prism even in dim or dark conditions. With these superior capabilities, the QS allows you to finish the work within the schedule when the conventional technology requires carry over. If the job can be completed in a shorter time, you can undertake more survey projects. The QS not only reduces the burden of your survey crew, but also increases the profit - with even less efforts than with conventional instruments. Back sight observation has never been easier. Simply recall the BS data, and the QS rotates and collimates it by itself. This feature dramatically facilitates backsight orientation as well as accuracy checks during survey. hard-to-measure objects such as wet road surfaces or manholes, darkest colored slopes or rocks. In combination with the 2,000m super-long-range non-prism capability, the QS provides ultimate power in distance measurements to ensure maximum productivity. Three advanced technologies exponentially increase stakeout efficiency. Simply select the stakeout point on the touch screen display, and the QS automatically turns toward the stakeout point, quickly and precisely. The point guide LEDs allow the prism person to easily find the line of sight. Simply move until both lights can be seen, and place the prism. With a single tap on the screen, the QS collimates the prism by itself and takes measurement to graphically display directions and distances to the destination, allowing for locating the stakeout point quickly and easily.